If you’re going back to school / college this Fall, mosey on over to Threadless.com and you’ll notice that they’ve started their popular $10 t-shirt sale. If school isn’t your cup ‘o tea, no worries, $10 will snag you a few t-shirts to last quite a while. 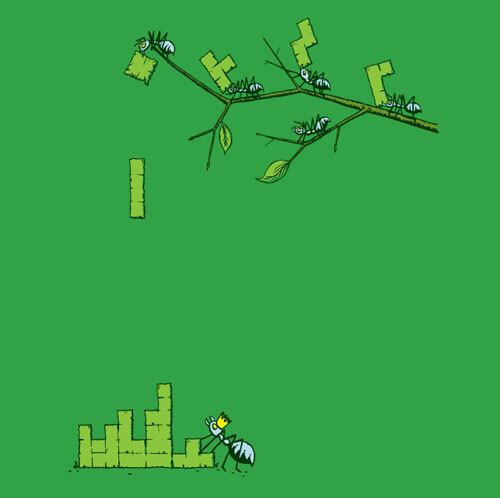 You’ll find one of my favorites from the sale below – ants trimming tree leaves to look like Tetris pieces. I’m also on the look-out for alternative t-shirt stores online to add a few more shirts to my collection. Drop recommended links in the comments below and let me know. Syl says I have way too many t-shirts. Whether or not she is hinting that I have way too many Threadless or t-shirts in general [is another matter]. Not that [it really] matters. I get to wear flip-flops, shorts, and tee’s to work! * Note that I’ve used Threadless referral links above. If you would rather hit Threadless directly without letting them know you came from 5thirtyone.com, use this link.